A free learning & collaboration community for physicians. education, you guys would deserve it." A Personalized Adaptive Learning System added to the premium content of Virtual Curriculum. Peak guides you to the most relevant content based on your learning needs and helps you engage with content more effectively with tools like highlighting and personal notes. Tracking tools monitor your progress and help you learn more efficiently by decreasing redundancy in the future. 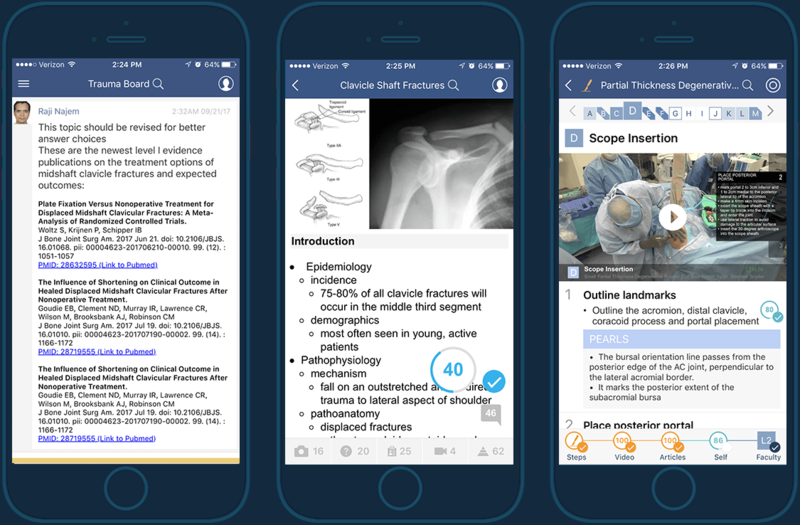 Our Bullets* App syncs with Peak so you can learn in small blocks of time in the hospital when you might otherwise not study. Click the PEAK Tracker below to see how you rate mastery of different learning activities. Memorizing topics lays the foundation of knowledge needed to eventually apply knowledge and think critically. Learning topics is best accomplished in layers. As a junior resident you should focus on presentation and nonoperative treatment. As a senior resident you should focus more on operative treatment, techniques, and complications. Target Content: Orthobullets Review Topics. Does not include Technique Guides or Approaches, as that is captured under the Skill component of Peak. Mastery Trigger: Click on the Topic Selfmastery wheel to advance based on the scale below. Questions are a "poor-mans" version of case-based learning, which is the best way to learn to apply medical knowledge, evidence, and to think critically. Questions work best in repetition, where you see the question over and over again, going deeper into the explanation and references. Target Content: Orthobullets and AAOS SAE Questions. We recognize some of the AAOS SAE questions are dated and need improvement. However, we still think they should be taken as they included valuable tested concepts. Even if the correct answer is outdated, it is important to know that historically a condition was treated differently - a question can still be a great educational tool even though it is a "bad question" from a diagnostic perspective. Skimmed question once briefly and answered. Did not read explanation. Did question carefully, and got it wrong, read explanation after. Did question carefully, and got it correct, read explanation after. Recognize question, know correct answer, have read explanation and all related article abstracts. Above and taught others why the answer is correct, and why the evidence supports it. In today's world of medicine, having a firm grasp of the evidence is essential to take good care of patients. Unfortunately, there is a "sea" of evidence, and it can be difficult and time-consuming to choose what is important to read. Orthobullets has done the hard work of filtering for the evidence of which you need to be aware. Target Content: Only Orthobullets "Tested" articles count as target content. "Tested Articles" represent a small subset of all the articles and have met specific Orthobullets inclusion criteria. Mastery Trigger: Click on the Selfmastery wheel for EACH "Tested" article to advance based on scale below. Read all sections of abstract carefuly. Read full article briefly with focus on Discussion and Conclusion. Read full article carefully and reviewed References. Teaching cases are the "cadillac" of learning to apply medical knowledge, the latest evidence, and think critically. They are important because they allow residents to make decisions in an algorithmic pathway - e.g., so you got an MRI in the ER and the patient is alert and oriented, so what is your next step in management? Target Content: Currently all cases linked to a topic count as target cases. Shortly, target cases will only include specific "core" cases that have been through a specific editorial process and have a certain teaching objective. Mastery Trigger: Vote on case polls AND add supporting evidence via Pubmed Insert Evidence Tool. Shows the % of polls that you have voted on and added supporting evidence. While you can learn a lot by reading on your own, didactic lectures from experts always highlights what is most relevant in clinical practice. A series of Core Videos will help residents take what they are reading, and see the relevance in clinical practive. Target Content: Currently all videos linked to a topic count in this counter. Shortly, only "Core Videos" that have a certain educational value and quality control will count in this counter. Mastery Trigger: Click on the Video Selfmastery wheel to advance based on the scale below. You can't expect to do any surgical skill, for instance cutting the femoral neck in a THA, unless you have done your homework. Prepare for surgical skills by reading the basic outline of the skill steps watching select videos, and reading key articles and portions of textbook chapters. Take notes and highlight so you don't forget what you learned. 1) STEPS - reading the Orthobullets "Steps" of a skill that have been created by orthobullets. Orthobullets Techniques are largerly incomplete at this time, and will see rapid improvement as they are updated by experts in the field over the coming months. Mastery Trigger: Check the "Mark Skill as Read" under each Step. 2) VIDEOS - only Orthobullets Technique Videos count. Currently we only have videos for one procedure posted. We plan on releasing 1-2 Technique Videos per month. Mastery Trigger: Click on Video Selfmastery Tool of Skill Technique Video per the scale listed above under videos. 3) ARTICLES - we will continue to select several articles, which may be a scientific articles or a section of a Technique textbook, which we feel should be read prior to attempting to do a surgical skill. We will do our best to make sure a PDF is provided. Mastery Trigger: Click on the Article Selfmastery Tool on Skill Articles per the scale listed above under articles. Number represents % of total requred Skill Tasks completed. We know surgeons can teach themselves most surgical skills by passive observation and trying on their own. Our selfmastery system allows residents to track their selfmastery on each step of a skill. Highlighting and taking notes allows residents to document what they learned for future reference. Target Content: This includes the Orthobullets "Steps" for each Skill. For each of these "Steps" the surgeon rates his Self-mastery on the scale listed below. Mastery Trigger: Click on the Step Selfmastery Tool to advanced based on the scale below. Never seen surgical "Step" performed. Watched surgical "Step" but not involved. Watched surgical "Step" and partially invovled (held retractor). Did surgical "Step" start to finish under close supervision. Did surgical "Step" independently and comfortably without supervision. Tried to teach surgical "Step" to another surgeon. Just like you need a "spotter" when benching 20lbs more than ever before, you need to engage faculty so they can "spot" you on your "sweet spot" skills - the skills you can't quite master on your own. By focusing faculty teaching effort on your target "sweet spot" skills, we believe we can greatly accelerate how you move up the learning curve. Target Content: A "sweet spot" skill is one in which the resident has completed all the prerequisite skills (skill of easier complexity level), has completed on the Preparatory Tasks, and has Self-Mastered to 80%. In our opinion, only then is a resident ready to engage a faculy and have the most productive teaching/learning experience in the OR. Mastery Trigger: Faculty MSE Level increase once faculty or resident assess you as a good or excellent on MSE. SKILL COMPLEXITY LEVEL: Our surgical Skills, are broken down into 5 levels of complexity and correlate with the ACGME milestone levels. A resident should reach a Level 4 by the time he graduates from residency. He should have reached a Level 5 by the time he has completed his fellowship. L1 Graded as good or excellent on ACGME Level 1 skills. L2 Graded as good or excellent on ACGME Level 2 skills. L3 Graded as good or excellent on ACGME Level 3 skills. L4 Graded as good or excellent on ACGME Level 4 skills. L5 Graded as good or excellent on ACGME Level 5 skills. and reporting platform for academic institutions. Objective and Transparent ACGME Medical Knowledge Levels through testing, not faculty evaluation. A competency based surgical skill training & evaluations system that is mobile, user-friendly, and improved technical training. Accurate ACGME levels AND summative faculty feedback the residents want. Implement a structured curriculum including daily emails reviewing 500+ topics, daily key scientific articles, and monthly diagnostic Milestone exams. Track your residents though a Technique Guides & Skillmaster of 150+ procedures with videos, articles, quizzes and self-mastery tracking. Give resident summative faculty feedback on the ACGME core competencies at the end of each rotation using a modern mobile platform. Generate ACGME Medical Knowledge levels through testing rather than time-consuming and expensive faculty evaluations. Competency-based Point-of-Care Competency-based Point-of-Care Evaluations for specific skills with well-defined educational objections. New end-of-rotation summative evaluations that collect ACGME levels AND subjective feedback. Have your CCC review ACGME Medical Knowledge levels virtually with the ability to override values based on other sources of performance data. ACGME Patient Care Levels derived from cumulative Point-of-Care Grades on a 1000+ competency-based skill evaluations. Clearly identify and document residents who have deficiencies. Track and sort subjective comments. Run analytics on your residents individually or as a whole, compare them to national data, and implement improvement plans. Identify surgical skill deficiencies and adjust rotations schedule to ensure all residents meet their ACGME Patient Care Skills by graduation. Identify areas of improvement and track improvement. Track and sort subjective comments from comments by faculty in multiple locations. Increase your OITE scores and pass the boards without stress by utilizing our Qbank of AAOS SAE questions and OB question! Identify your areas of strength with our monthly diagnostic Milestone Exams. Get unlimited access to study plans, including OITE, ABOS, and CORE Curriculum. Enhance your operative skills through Self Mastery Skillmaster tracker, and Technique Guide. Your performance data is safely gathered and stored for program use only. Track residents' Medical Knowledge progress through monthly diagnostic Milestone exams and other custom exams. Sync your program's lecture schedule with the Orthobullets 365-Day Core Curriculum. Ensure all residents meet their ACGME target levels for Patient Care. Help your program with ACGME Biannual reports by ensuring End-of-Rotation Professionalism evaluations are complete. Create subspecialty exams from a pool of 5000 orthobullets and AAOS SAE questions. Strengthen your subspecialty knowledge and stay current on the literature through our annual fellowship-specific Subspecialty Study Plans. Master your subspecialty operative skills through topics, videos, quizzes, Technique Guide and Skillmaster. Ensure all residents are on track for Medical Knowledge, Patient Care, and Professionalism ACGME milestones. Take the pain out of ACGME reporting. Leverage easy-to-use ACGME reporting functionality, including automated end-of-rotation summative evaluations for ACGME Milestones (MK, PC, and Prof.). Save hours in CCC meetings! Make sure OITE scores stay high and all residents pass ABOS Part 1. Generate ACGME Medical Knowledge levels through testing data, rather than through expensive and inefficient faculty evaluations. Make sure residents reach their ACGME Patient Target levels through our competency-based skill tracking and evaluation system. Achieve 90% evaluation compliance at 60 days with our new mobile Evalmaster app. Easily create ACGME Biannual Milestone reports and summative end-of-rotation evaluations for all ACGME core competencies - saving hours in CCC meetings! Enhance and align your medical knowledge training with our Core Curriculum and stay on the same page as your residents. Save your CCC team 120+ FTE hours doing ACGME evaluations via our automated platform. Ensure a higher quality of care in the OR by identifying which residents are ready for advanced procedures. Make sure all your residents pass the boards. Make sure all your residents gain the surgical skills needed upon graduation. Utilize a transparent skill tracking system that demonstrates residents are developing surgical skills and staying in the “safe zone” to ensure patient safety. Increase faculty engagement by streamlining evaluations. Save FTE hours across your entire team when generating ACGME Biannual reports.